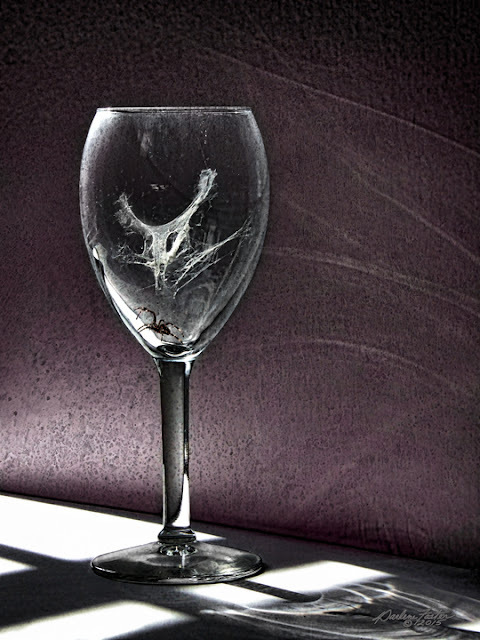 Along Came a Spider ©2015 - I discovered this wine glass lost and forgotten in the recesses of a kitchen cabinet. A resident spider apparently decided it was the perfect place to set up housekeeping, spinning a fascinating web tethered to the inside of the glass. Unfortunately, the spider's choice of real estate wasn't the best for attracting prey and it would appear he met his demise huddled beneath, waiting for dinner to be served. As I examined his creation, it immediately reminded me of a cow skull that Georgia O'Keeffe was so fond of painting and I knew I had to use it in a composition. After trying it in several different ones, it struck me that with this, simple would work the best. I placed it on a table in my studio in front of a window with streaming, afternoon sunlight that highlighted the web perfectly. I replaced it's deceased architect with the image of a spider from my backyard, added some texture and filters and "Along Came a Spider" was complete.